Automated Teller Machines (ATMs) have been around in the world since late 1960s. The world’s first ATM was installed in Enfield London on June 27, 1967 by Braclays Bank. In India we have it since 1987 and today there are close to 2 lacs ATMs across the country with a few hundred being added every month. The number of ATMs, which stood at a little over 27,000 as at end-March 2007, has increased to over 1.93 lakh across the country by end-March 2015. At the inception of the ATM culture, banks were allowed to open ATMs only in their premises but later they were allowed to expand and operate as standalones. Then time came when Banks realized that managing ATMs was a specialized activity and they need to outsource the management of this activity to entities specializing in this area and thus came into picture the “BROWN LABEL ATMs”. These ATMs were still owned by the banks but they would pay a fee to an agency to maintain and run them. Though the country has been adding an average of over 16,000 ATMs every year for the last five years, the growth is largely concentrated in the urban markets. For rural areas, this development has remained a distant dream. This can be attributed to poverty, illiteracy and lack of regular income of the unbanked as well as banks' limited reach, high transaction costs and unsuitable product portfolios. Also, as the normal banking model is found wanting in terms of scalability, convenience, reliability, flexibility and continuity, banks hesitate to set up shop in rural areas. 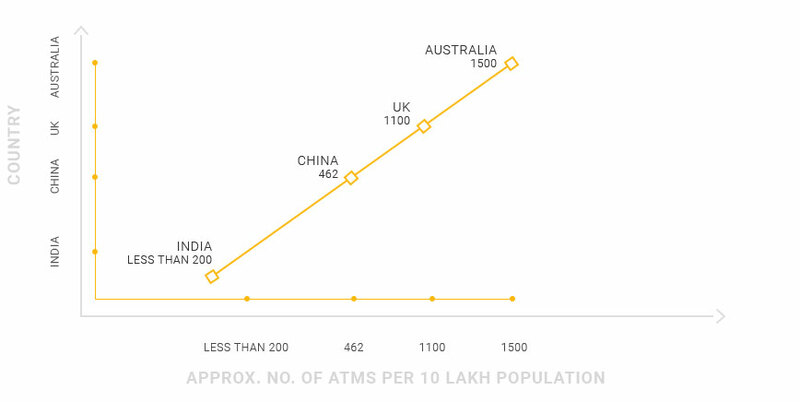 The ATM penetration of India is less than 200 per million population of the country in contrast to 1500 of Australia, 1100 of UK & 462 of China. However, the Government has started several initiatives to set a change in the current scenario. Understanding the need to take banking to rural and under-penetrated tier 3-6 areas of the country, RBI issued guidelines for introducing White Label ATMs in the market. These ATMs have the same features like any other bank ATM, except that they do not have the label of a particular bank on it. Bank ATMs we used so far had two parties involved—a bank that sets up, owns and operates an ATM and the authorized payment network operator such as Visa and Mastercard. For white label ATMs, there are three parties involved: non-bank entity sets up, owns and operates it; a sponsor bank for cash management purpose, funds settlement and customer grievance redressal; and an authorized payment network operator. We can say that the ATM industry in India is rapidly transforming from the traditional methods ATM operations into internationally accepted ones. Companies operating in other sectors in India as well as abroad are eyeing the Indian ATM managed service and outsourcing market since the market offers immense potential. The business of ATM outsourcing has been growing exponentially in India as the ATM industry continues to move from bank’s managed ATMs to end to end deployment by service vendors. Managed services companies are increasingly venturing into the ATM deployment space. From the period FY- 2015 to FY – 2019, it is anticipated that the complete outsourcing ATM market will grow robustly at a CAGR of 34.3% and contribute a lot to the overall revenue of the ATM Managed services and outsourcing market by FY-2019. Furthermore, it is believed that in the long run, completely outsourced ATMs will take over the ones under managed services since cost benefit to the bank under this model is greater as compared to the managed services model. So far despite a constant growth, the deployment of ATMs in the country currently is lop-sided with a significantly large presence in metropolitan and urban areas as compared to rural and semi-urban areas. Even with an approximate of 2 lakh Automated Teller Machines (ATMs) in the country, growing at 27 per cent year-on-year, India is considered to be an underpenetrated market compared to other contemporary nations. With the introduction of WLA ATMs, we hope that ATM penetration across the country will see a good positive change. India is considered still to be one of the lowest ATM penetrated market when compared to the other developed and developing countries. So, understanding the need to increase ATM penetration in the country and take banking to rural and under-penetrated tier 3-6 areas, in February 2012, the story of WHITE LABEL ATMs in India started when the Reserve Bank of India (RBI) issued draft guidelines for White Label ATMs inviting comments. The final guidelines came out in June the same year. But it was only a year later, in June 2013, that Tata Communications Payment Solutions Ltd (TCPSL) launched the first white-label ATM in India. This has been started with the objective of increasing the ATM density and also building the rural and semi-urban ATM infrastructure. It took nearly two years for the entire process to become operational on ground. For a simple understanding, below are the major differences between a Brown Label and a White Label ATM is that banks outsource the ATM operations to a private own company that operates the machine, pays rent for the premises etc for Brown Label ATMs, whereas White Label ATMs are owned and operated entirely by Non – Bank entities but they are not doing “outsourcing contract” from a particular bank. The premises are rented by this private entity only that operates the Machines. White Label ATM company (non-bank) Rents the place, looks after maintenance and servicing of the machine. Sponsor bank Loads the cash in those White label ATMs. This also ensures counterfeit/fake currency notes are not circulated through white label ATM. They provide technical connectivity in the system. Any customer belonging to any Bank can use it. Every month five transactions are free. White label ATM users can also withdraw a maximum of 10,000 per transaction. Open 24/7 and on holidays. Value added services like mobile re-charge, utility bill payments etc are available. Convenience to bank, because they don’t have to keep large staff/office (compared to a system without ATMs). It reduces their cost of branch-operation.